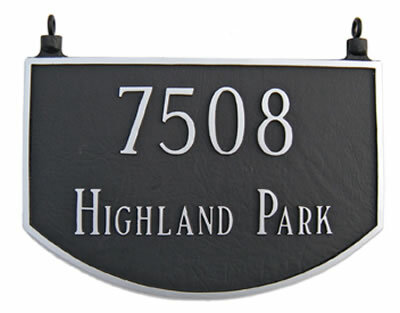 This two-sided address plaque is a hanging plaque with the address cast into both sides. 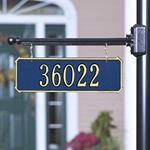 The address plaque is made of durable, rust-free recycled aluminum. 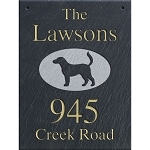 The finish on the plaque is specially formulated to withstand temperature extremes. Eyebolts are cast into the plaque. Hand-crafted in USA. A 19" long sign bar with fastening bracket is available. The hanging bar's mounting bracket has a slight curve that allows it to be mounted on a flat surface or pole. The bar is custom designed to hold this plaque. Mounting hardware is provided. The bar and bracket are black and made of recycled aluminum. If you are using your own bar, most bars can be adapted to hold the plaque using S-hook and chain from a hardware store. Eyebolt to end of bar:1.5"